After the war, demobilised New Zealand soldiers considering architecture as a career found many opportunities to further their education in Great Britain. With the immense task of postwar construction before them, many British architectural firms and institutions were reinvigorated by the influx of the Empire’s students, and the IWGC acted quickly to attract graduates to the offices of its principal architects. Several soldiers won New Zealand Expeditionary Force soldier scholarships. This enabled former servicemen to study at the Architectural Association in London, and to sit the Royal Institute of British Architects (RIBA) exams. Work in an architect’s office followed, and graduates could find the support to improve their experience, compete in architectural competitions, and eventually establish their own practices. The following architects crossed paths with Seager at various stages throughout his time overseas as New Zealand’s war memorial architect. 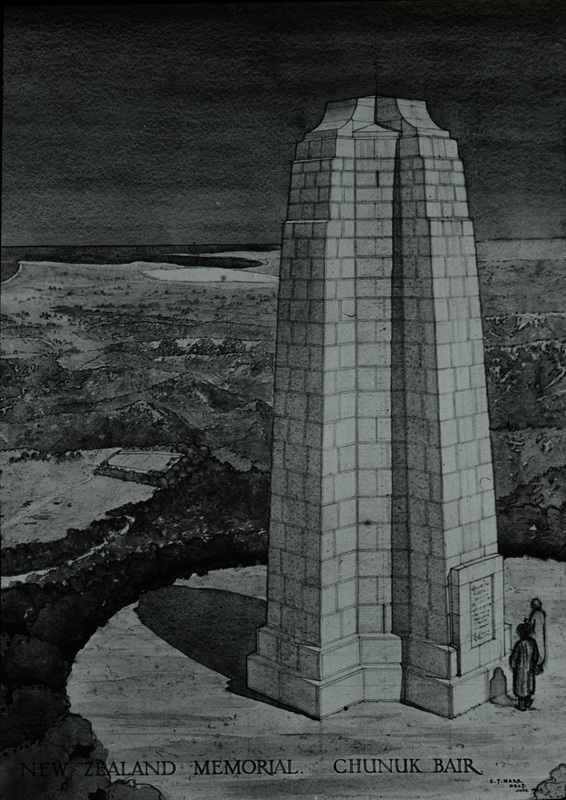 E. T. Marr's perspective drawing of the Chunuk Bair battlefield memorial, c.1924. Lieut. Edmund Townsley Marr (1891–1977) of Gisborne was articled to architect G. W. Allsop in Auckland until he enlisted in 1916. After being discharged, he worked in the firm of Mewès and Davis in London. He won a NZEF scholarship to study at the Architectural Association and qualified as an Associate of the RIBA in 1920. Marr joined Sir John Burnet’s office and was seconded in early 1921 to Gallipoli to assist designing war cemeteries and memorials. He returned to New Zealand in 1925 to practice as an architect, and later served in the Second World War. 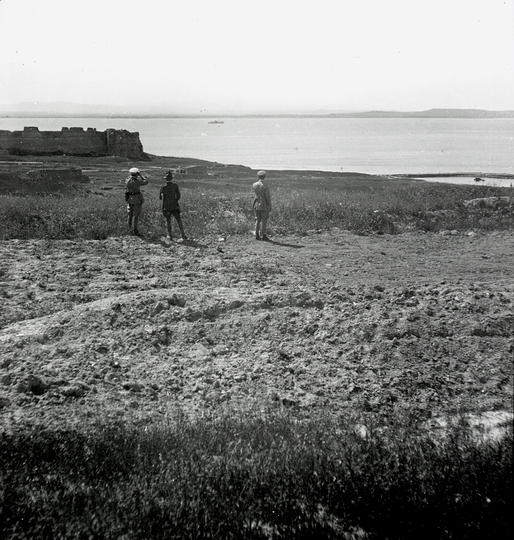 Marr was among the party that escorted Seager on his visit to Gallipoli and is seen here at Cape Helles, with Lt. Col. Nangle and Col. Hughes, looking towards the Old Fort at Seddülbahir. He also produced at least one perspective drawing for the Battlefield Memorial at Chunuk Bair, dated June 1924. Cpl. Edward William Armstrong (1885–1968), also of Gisborne, worked in the office of architects Burr and Mirfield before leaving for the war in June 1918 with the 34th Reinforcements. He received a £200 NZEF scholarship to study at the Architecture Association and was placed second in the prestigious Rome Prize in 1921, winning the Henry Jarvis scholarship and becoming the first New Zealander to do so. Armstrong also worked in Sir John Burnet’s office and contributed a perspective sketch of the Chunuk Bair memorial in 1924. After practising in Rangoon, he won the design competition for the Robert McDougall Art Gallery in Christchurch in 1929. The design adopted Seager’s scientific method for lighting art galleries, known as the top-side lighting method. Cpt. Stanley Natusch (1889–?) was the son of Wellington architect Charles T. Natusch. He served in the 1st Battalion Canterbury Regiment at Gallipoli and was later wounded in the Battle of Messines. He was awarded the Military Cross. In 1919, Natusch secured a NZEF scholarship and studied at the Royal College of Architecture in London. He and fellow New Zealander J. H. White were part of a group of young architects who won a competition to design a new type of inn for the Worshipful Company of Brewers in 1921. Based in London, Natusch worked with Seager on the architectural drawings for the memorials at Messines and Gravenstafel. In 1923 he worked for a few months in the office of a New York architect before returning to New Zealand to join his father’s firm. 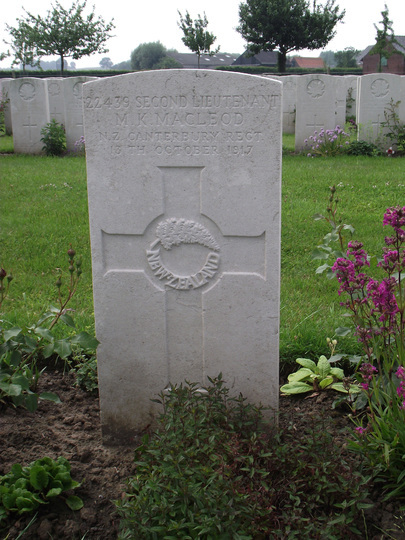 The grave of Murdoch Keith Macleod at Nine Elms British Cemetery, Belgium. Lt. Arthur William Mildenhall (1884–1951), of Christchurch, served in the Field Engineers as a sapper for the whole duration of the war. Mildenhall was based with the IWGC unit at Gallipoli, and he and Lieut.-Colonel Hughes were responsible for suggesting a suitable site for the Chunuk Bair memorial in 1920. As Chief Clerk of Works Mildenhall personally supervised the construction of the memorial. He then worked for the Commission in France from 1924. Architect and Second Lieutenant Murdoch Keith Macleod died on 13 October 1917 from wounds received at the Battle of Messines. He was twenty-seven years of age. While completing his articles with Seager in 1906, then in partnership with Cecil Wood, Macleod attended Christchurch Technical College and the Canterbury College School of Art. He was considered a promising student and became Seager’s assistant prior to being made a partner in the firm in 1914. While Macleod did not survive the war, it is clear that his death, like that of numerous New Zealand architects and artists, would have been foremost in Seager’s mind as he worked on designing the battlefield memorials. Macleod’s headstone at Nine Elms British Cemetery in West-Vlaanderen, Belgium, displays the simplicity of the IWGC’s grave marker design for the hundreds of cemeteries it established.